As families grow, parents are busy keeping up with their kids’ lifestyles: school, birthday parties, and managing households. They often don’t notice their little ones have become teens. Play dates turn into parties—often requiring just as much supervision. Those rebel-rousing teens no longer ask to borrow the car, but instead heading off to college or moving out on their own. Unless they’re paying close attention, Mom and Dad literally wake up one day and realize their kids are gone and the house is empty. They’ve joined the ranks of empty-nesters. Some parents find themselves wondering what to do with themselves. Where does that leave them? Empty-nesters can’t be bundled into categories and handed a road map saying, "Here's what to do next." Depending on their goals, finances and lifestyles, there are a lot of choices. Many choose to downsize. What does downsizing mean? Again, it’s different for everyone. 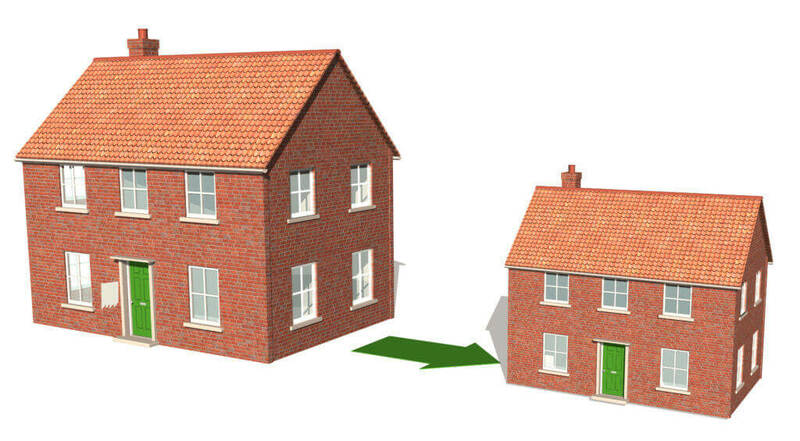 Basically, downsizing refers to a plan of action that includes making BIG changes. For empty-nesters, those changes often begin with garage sales and trips to Goodwill, carting away truckloads of "stuff" the kids left behind. Once those outgrown toys and boxes of school papers are cleared out, there’s a lot of empty space and many homeowners see the value in downsizing. They’re ready to sell the house. Some people choke back tears at the thought of it. Others can’t get the sign up fast enough. These are the motivated sellers. They’re ready to cash in on all that equity they’ve built over the years and apply it to something they really want: a condo, a European cruise or both. The point is, they’re ready to sell and they want to move fast. For those who want to sell quickly, working with Realtors® isn’t the quickest way to reach goals. It can take months and even years to sell a property this way. It also requires an investment at the onset. Realtors®, who are paid by commission want to get the best price for the properties they represent. They are aware that buyers act partially on appearance so they often suggest owners put some money into renovation before showing the house. This isn’t what every seller wants. Some just want to get it over with. As an investor, you can offer attractive solutions. One of those solutions is a quick sale. As a real estate investor, you’re wise to look for empty-nesters. Tell them about a way they can speed up the sales process by selling to you or your team, and you’ll have their attention!